For great Golf Vacations in Mexico, El Tamarindo Country Club is rated in the top ten golf courses by Best’s Golf Guide, and number two in the top 30 best golf course and resorts category. The “Resorts” Category means that the course is open to the public, and not a private course. This is a very good example of what they mean when they say “Golf Mexico”! 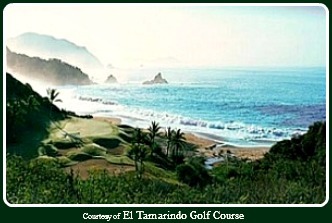 This 18-Hole golf course is located approximately two and one half hours from Puerto Vallarta, and about one hour from Manzanillo. Many golfers who have played the course and taken advantage of the many wonderful amenities offered at El Tamarindo, say it is one of the most beautiful golf courses in the world! This Golf Resort is one of the best Golf Vacations in Mexico. Golf course architects Robert Trent Jones Jr. and David Flemming have created a classic course within the spectacular topography afforded to them throughout the design. It is a vast ecological nature preserve with extensive ocean beaches and inland jungle mazes. This is part of the charm of the more than two hundred acres of tropical rain forest upon which the course is situated. The El Tamarindo Course is extremely well maintained from Tee to Green, with medium speed Greens conditioned to a velvety texture. All Holes on this 6,682-yard, par-72 course are challenging and spectacular! There is not one “average” or plain hole within the 18 beautiful Holes. Situated between deep forest ravines and rugged cliffs extending down to the crashing surf, the Tee Boxes, Fairways and Greens flow throughout in astonishing fashion. You may well find it hard to concentrate on playing golf! This may be your best Mexico Golf Vacation Package yet. 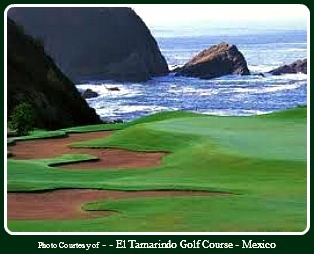 As stated above, this course is rated #2 of the Top 30 Golf Course resorts. We will have articles such as this one, on all thirty golf course resorts. One of my goals is to visit and play each and every one of the thirty courses. We hope you are able to find your way to some of these wonderful courses yourself! Golf Vacations in Mexico are an adventure. Click on the above Link and find out all about "Retiring in Mexico!" If and when you play any of these courses, please let us hear about your adventure…..and take plenty of pictures and send them along! This is a Mexico Golf Resort opportunity you won’t soon forget. Golf Vacations in Mexico are the thing to do! There is a Mexican Golf Vacation Package just waiting for You!